How pathetic is this? It’s been nearly a year since I posted anything to this personal blog after having resolved to be more frequently active in this forum. And cliché that I inject some atropine just as the new year is upon us. Happy New Year! I’m happy to announce for the new year that I’m embarking on an initiative to lose 40 pounds by my 40th birthday in September. I’ll post periodic updates on this blog, but to avoid cluttering things up too much I’m creating a new blog so I can blog regularly about the specifics of my journey (eating habits, exercises, short-term goals). You can follow the details of my quest here. Like many others, I’m planning a few changes for my life for next year. I’m a believer in finding one’s own way, while still abiding the advice of the wise. Often called upon for inspirations are the timeless words of Confucius, the inspiring speeches of Martin Luther King, the controversial yet insightful analyses of Sigmund Freud, and the various authors of the Christian Old Testament book of Psalms. I find value in all of these, but for next year, I’m trying something a little different. I’m going to look a little further off the beaten path to the words of one of the most unforgettable personalities of the twentieth century. That’s right. 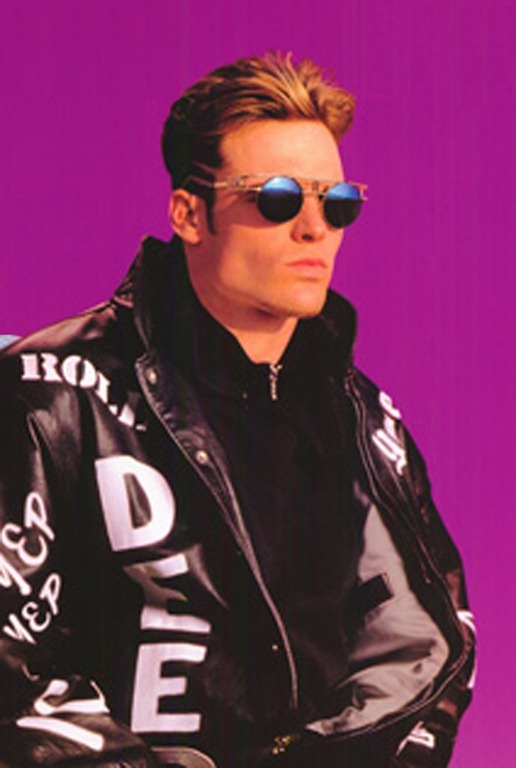 I’m invoking the wisdom of Vanilla Ice. His hair was whack. His clothes were loud. His ink was plentiful. His bass line was stolen catchy. But in the words of his best known contribution to pop culture, I’ve found inspiration for the next twelve months of my life. 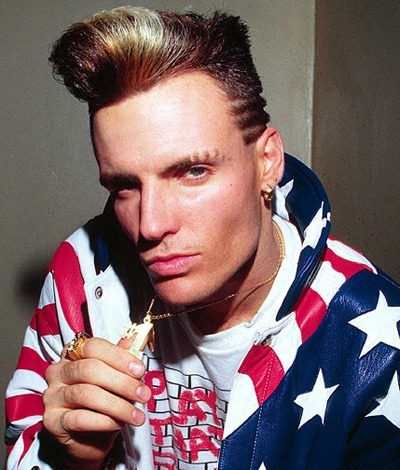 In 2012, I’m living out Ice Ice Baby. I spent almost two thousand hours working last year – and that’s just my “official” work which doesn’t include after-hours writing projects, travel time, speaking, and professional reading. But as I look back on the year, I can enumerate only a few new things that I learned. Sure, I got incrementally better at the things I already knew, but 2011 is the first year in several that I can’t say that there’s one particular new thing that I’m proud to have truly conquered. I’ve given this advice to others, but it seems that I’ve failed to follow it this year: Stay on top of your professional development. Don’t just stick with what you now know – branch out and learn. I’ve had a “do” mindset this year, which is noble, but one also has to take pause to learn new things to continue growth. Data Quality Services – there’s not a huge amount of buzz around this yet, but as a business intelligence consultant I see grand potential in this tool. Every organization, without exception, has bad data. I’ve spent very little time getting to know DQS, but I’m planning to dive in to it in 2012, and I expect to be knowledgeable enough to be blogging about it by midyear. Analysis Services – Although I’ve been working with SSAS for a couple of years now, there are still a few facets of the product that I haven’t yet mastered. I expect to remedy that next year as I explore the product more thoroughly. Kimball – I use the Kimball data warehouse methodology every day, but there’s so much more left to learn. The Kimball Group has published dozens of books, and I’ve read only parts of a few of them. To a BI professional, this collection is The Bible. I commit to not just own and reference these works, but to consume them with vigor. Photoshop – Yes, this is completely unrelated to my BI career, but as many of you know, my wife and I started a photography business this year. Although she’s running the business, I want to be in a position to help her out as much as possible. I’ve been using Photoshop (the consumer version) for about a year now, and I have learned enough to perform most basic and a few advanced operations. Toward that objective, I’m acquiring some training materials and am planning a self-guided education to take my postproduction skills to the next level. There’s a dirty word that I keep overusing. I’ve tried not to say it, but it just keeps slipping out. Sometimes I say it subconsciously, and other times I blurt it out in the heat of the moment. As yet, nobody has said it to my face, but I suspect that others may be talking behind my back about my overuse of this word. Individually, a Yes is a good thing. Helping a friend, leading a team, and participating in a charity event are all great things to agree to. Saying Yes isn’t the enemy. Saying Yes too much, however, can get you in trouble. I’ve been too quick to say Yes to almost every request, and I’m embarrassed to admit that it’s put me in a bind a few times this year. Saying Yes isn’t just a way to end a conversation – it’s a commitment. When you say Yes to something, you’re telling someone, “Don’t worry about the thing you need done. I’m going to take care of it for you.” It’s a transfer of responsibility. Even if it’s not in writing, it’s a contract. To say Yes with no reasonable possibility of delivering is self-delusion. Faking. If there was a problem, yo, I’ll solve it. I have to admit that I wasted a lot of time and mental energy worrying about stuff in 2011. I made some big commitments in this past year and for the most part I’ve delivered (albeit late, in a few cases) on those commitments. However, my tendency to procrastinate was in high gear this year, and I put off until the last minute some tasks that I could have easily checked off my list. This behavior turns into a vicious cycle – procrastination leads to worry when the deadlines start to close in, the worry becomes a distraction that makes it difficult to concentrate on the thing that needs to be done, and the distraction makes it easier to keep procrastinating. I’m setting a different standard for myself in 2012. If something needs to be done, I’m just going to do it. Is it really that simple? It can be, yes. As an incentive, I’m reclassifying some things that I have previously considered to be entitlements. Watching TV (even my favorite shows), recreational reading, Facebooking, playing Wii, and other similar downtime activities fall into that group; rather than doing these things whenever I choose (or to avoid doing something else), I’m developing a realistic reward system to help balance work with play. By prioritizing the things that need to be done over the things that are enjoyable but not necessarily productive, I expect to reclaim the time I’ve been wasting in worry. I really enjoy writing, and I’m a pretty decent writer. So why don’t I do more of it? Oh, that’s right – I’ve been procrastinating (see previous bullet). In years past, I’ve been quite an active blogger – I’ve consistently blogged as frequently as once or twice a week. These days, that number is more accurately measured in blogs per month (or even per quarter). That’s simply unacceptable. It’s not that I’m not capable of writing more, nor do I have a lack of material. I’m a consultant – the world is my muse. The only explanation is that I’ve not chosen to make blogging a priority this year. Now to be fair, I have been busy writing this year – I contributed to the MVP Deep Dives V2 earlier this year, and I’m currently wrapping up another book (SSIS Design Patterns) to be released early next year. However, this is still no excuse to skip out on blogging, which has a faster turnaround, generally requires less effort and research, is more flexible in terms of content, and often reaches a larger readership than book projects. For someone with so much to say, blogging should be a part of my regular routine, not just something that I do when I have spare time. I’m going to light the fire in 2012 again. I’m setting a goal of one professional blog post per week, with the expectation that I’ll do more than that. I’ve proven that I’m capable of more than that, and by removing the distraction of worry, I haven’t the excuse of not enough time. Further, I’m setting aside weekly time – two hours per, as a start – for blogging, and I’m considering that block of time to be wholly reserved for blogging and not a flexible time slot to catch up on whatever task happens to be overdue at the time. In the same vein, I’ve recently revived my personal blog and will continue to share on that forum. In the past, I had posted to my professional blog just about anything, including items that would be of little interest to those who don’t know me personally. Having the separate personal blog allows me to blog more frequently about topics that interest me without annoying the professional audience on my technical blog. Plus, I want to be able to share a piece of myself with my kids when they’re old enough to understand, and I don’t want them to have to try to distill the personal stuff that interests them from the professional stuff that doesn’t. I haven’t made a hard commitment on a number of personal posts, simply because of the variety of frequency in which a bloggable event occurs. Some might be deep and insightful monologues (I blogged last week about my mom’s house fire back in December of 1980), but others may be quick thoughts about my day. I’ll blog on my personal site as often as appropriate, and I’ll let that play out however it will. My job is literally killing me. I really, really like what I do. I work with great people, I get to solve difficult and interesting problems, and I don’t have to brave the elements while I work. Plus, my job isn’t physically strenuous. And while that last part is a good thing, it’s also a bad thing – it means that I spend almost all of my working hours (sometimes 70-80 of them per week, counting my writing, photo editing, etc.) sitting on my posterior. Although my numbers (weight/BMI/cholesterol/blood pressure) are reasonable for my age, I’m in the worst shape of my life. I don’t walk enough and hardly ever run. I’ve worked up a sweat maybe four times in the last two months. I deal with a higher-than-average amount of stress. Any M.D. on the planet who read the last two paragraphs would scream at me that I’m headed for really bad stuff in a couple of decades (if not sooner). The year 2011 is almost done. As you can infer from the above, I’m not altogether happy with my progress this year, and as of now I wash my hands of that old way of thinking. Now that it’s in writing, I’m committed to follow through, with the expectation that both of my loyal blog readers will call me out if I stumble. And perhaps by this time next year, you’ll all be jealous ’cause I’m out getting mine. I’m the luckiest guy in the world. It’s cold outside but yet I’m warm. Much of the world is hungry but I’m full. The world is full of disease and physical ailments, but I am healthy. Many are lonely, but I’m surrounded by my loving family. To my family and friends, I wish you a happy holiday season and a healthy and prosperous new year. Before I jump into a bummer of a story about Christmas, I first want to say that I’ve had thirty someodd great Christmases. I have fond memories of celebrating the holiday as a child surrounded by a mountain of toys, which is of course the primary reason for those ten and under to celebrate Christmas. I remember Christmas as a late teen and young adult, when I discovered that the magic of the holiday wasn’t in the material things but in spending time with family and friends. My experience came full circle about 8 years ago when my first child was born, and I got to witness him (and later, his two siblings) light up at the very thought of the holiday season. I’m a very fortunate guy. I’ve had more happy Christmas memories than most people on this big rock, and I try to remember every day that I won the genetic lottery by having been born to a loving family in a nation where we have the freedom to celebrate (or abstain from) the Christmas holiday. However, there was one Christmas many years ago that I’ll remember for all the wrong reasons. It was my worst Christmas ever, and I hope its tragedy is never surpassed. It was December of 1980. Texas had just come through the worst summer on record, with something like 70 straight days of triple-digit temperatures. I had just turned 8 years old a few months earlier; in fact, I was the same age that my oldest son is now. My brother, almost two years younger than me, and I were part of a fractured family; our parents had divorced years earlier and had separately moved on to other relationships. As a result, my brother and I lived with my maternal grandmother (a fact that will come into play momentarily). Like all kids of that age, we were totally awash in the spirit of Christmas, which is to say, we were ready for the toys! If I remember correctly, I was hoping for a Simon Says, a toy that would execute a flashing color sequence for the user to repeat. We were gearing up for 3 different Christmas celebrations – a big gathering with my dad’s entire family on Christmas eve, another event with most of my mom’s family, and a smaller celebration with just my mom, her boyfriend, my grandmother, and my brother and me. I couldn’t quite comprehend it at the time. When you’re 8 years old, your parents are indestructible, and going into the hospital is something that old people do just before they die. My grandmother left, leaving us in the care of another relative who had come over. I knew things were out of order, but I didn’t realize just how bad it was. What I wasn’t told that night was that my mom’s home had literally exploded a few hours earlier. Apparently, a slow leak had allowed gas to build up, and without warning the place erupted into an enormous fireball, consuming the entire upper residence of the garage apartment. 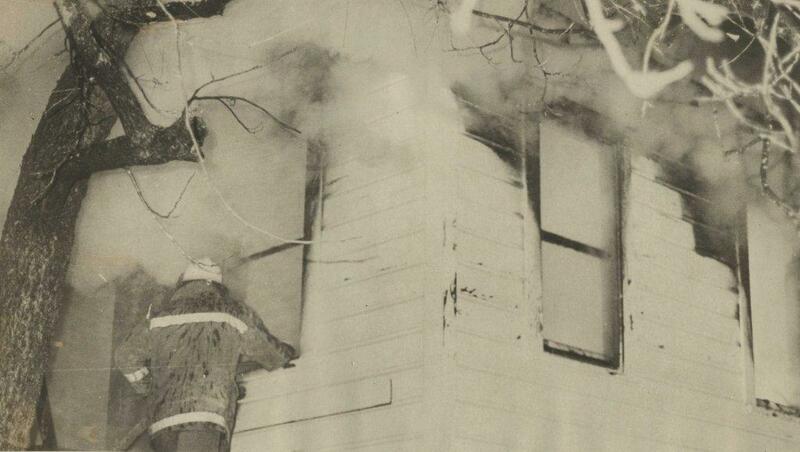 My mom and her boyfriend Tony were still awake at the time, but the ferocity of the explosion and their burns temporarily trapped them in the living room. The front door would not budge, leaving my mom with no option but to find a window from which to jump. Stunned, badly burned, and unable to see, she found her way to the bedroom and jumped out the window onto the narrow staircase below. Despite her extensive injuries, she was able to stumble into the cold night and across the street to a neighbor, who gave her comfort until the paramedics arrived. My mom’s boyfriend somehow got out as well, though to this day no one knows how. The fire department showed up quickly, and as firefighters worked to extinguish the blaze, my mom and Tony were tended to by paramedics. They were rushed in waiting ambulances to the local emergency room just a few miles away, where it was determined that the extent of their burns surpassed the capabilities of that hospital. They were both placed on board an air ambulance to head south toward Parkland Hospital in Dallas; however, the pilots received word that the facility was full, so they were flown instead to the burn unit in Oklahoma City. The next day, my brother and I were told the truth about what had happened, though mercifully our relatives kept most of the details from us. We were merely days away from Christmas at this point, and I recall being as distraught about “missing” Christmas as I was about the fire. 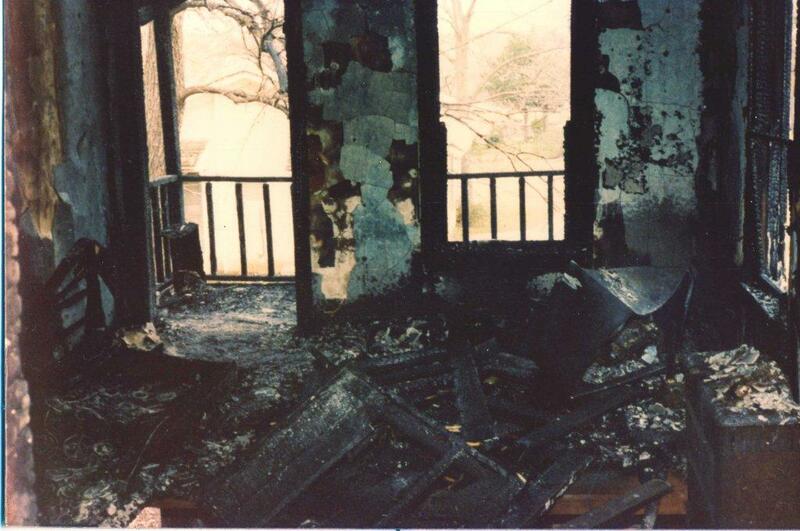 I can even remember selfishly wondering if any of our presents had survived the fire. My relatives were incredible during this time. They made sure that we not only had a place to stay and our essential needs met, but went out of their way to try to give us a Christmas as close to normal as possible under the circumstances. We spent several days with my paternal grandparents, had a lengthy stay with a great aunt and uncle (it seemed like months, though it was probably no more than a few weeks), and other relatives jumped in to keep us distracted and pass the time. As Christmas came and went, I recall becoming more and more unsettled. Even though our family situation was difficult, I was still worried sick over her. Would she ever come home from the hospital? Would things ever return to normal? What would happen to my brother and me if she died? I don’t recall my family ever taking us to see her while she was in the burn unit, but in retrospect this was probably a blessing as we wouldn’t have wanted to see her in that condition. Still, for this 8 year old kid, this was all too difficult to fully comprehend. 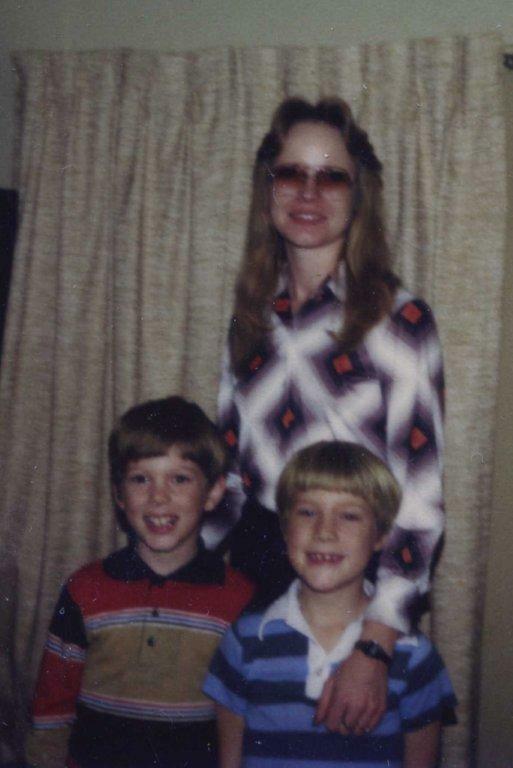 I can’t imagine what kind of hell my mom went through during recovery. She had extensive third degree burns across her arm and hand, which eventually required a skin graft. These days, they can perform skin grafts using the epidermis of cadavers (and even artificial skin from what I’ve heard), but in 1980, the most common method was to take skin from the very patient you’re treating. In my mom’s case, they had to take a large chunk of skin from her leg to repair her arm and hand, leaving her with not one but two major wounds to heal. I don’t recall how long she was in the hospital, but it seemed like an eternity. I remember her coming back home, thin and fragile and bandaged. I remember her screams as the bandages were changed and the skin staples were pulled. I remember her struggling through months of physical rehabilitation to regain her strength. In comparison, my suffering was trivial; I was a spectator, and she was the participant. To this day she doesn’t talk much about the fire or the months after, and I can’t blame her. Some people believe that everything happens for a reason. I can’t say for sure, but I’m more inclined to believe in chaos theory, that people sometimes find incredible fortune or suffering based on a series of unrelated and unpredictable events. Whatever the case, I am thankful for several things in this situation. 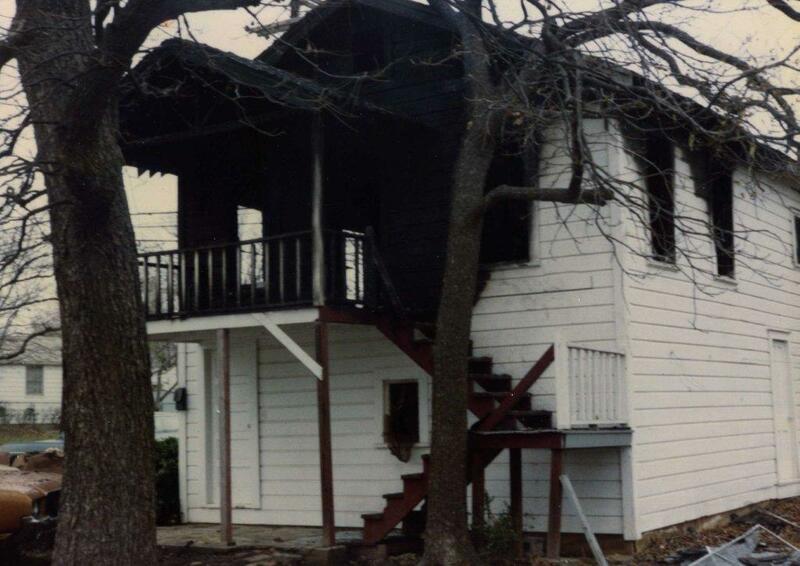 I’m happy that my brother and I weren’t in the house at the time; even though we were often embarrassed in front of peers at school that we lived with our grandmother and not our parents, who knows what would have happened if we had been living with her and were in that apartment that night. I’m thankful that my mom had the presence of mind to jump out the window when the door didn’t work. I’m forever grateful for the relatives that stepped up and took care of us at a moment’s notice. I wrote a piece the other day that read in part, “… an easy life can make you complacent and soft.” I would not have chosen to experience the Christmas of 1980 in that way, and I certainly wouldn’t want to see my loved ones experience the physical pain. Yet still, having gone through that experience, I am more able to keep perspective when things go wrong. I’ve had just a couple of less-than-delightful holidays since that fateful December, but I never let it get the better of me. Having had a glimpse into hell 31 years ago makes every other Christmas just a little bit sweeter. Each year at Thanksgiving, I, like many others, take a day of pause to recognize the things for which we are thankful. Although we’ll ideally be thankful throughout the year, this season seems to bring out the appreciative side in all of us. Most importantly, I’m thankful for family. My three kids are noisy, messy, high-maintenance, and expensive, and I’m the luckiest guy in the world that they call me Dad. My wife is a wonderful mother and somehow manages to tolerate my busy work schedule, my moodiness, and my geekiness. I’m thankful to have my parents (all four of them :)), three grandparents, wonderful in-laws, and my three siblings in my life. Thanks to the abundant procreation of my ancestors, I’m blessed with a large network of uncles and aunts, cousins, nieces and nephews, and other extended family. I’m thankful for good friends. When we moved from Sherman to Allen last year, we left behind a lot of friends, but thankfully we’ve stayed in touch with them and still manage to get together from time to time. I’m thankful for the new friends we’ve made since our move, and am excited about building those relationships. I’m thankful for my career. I’m fortunate to have found a way to earn a great living that truly fulfills me. I’m thankful for my employer – I work for a great company, with some of the most exceptional people I’ve ever met. I’m happy to have developed business relationships with some real visionaries, and am excited about where those relationships have taken me in the past year. I’m thankful for the new business we started this year and for the modest but tangible success we’ve seen so far. Materially, I’m thankful for the “stuff” I have. I’m glad to have my house, two reliable cars, and the conveniences of modern life. I’m thankful that I don’t have to worry about having enough money to pay bills or buy food. While we’re far from rich, I’m thankful that we have what we need to survive. I’m thankful for my health and that of my immediate family. I see others, some of whom are part of my extended family, who are having health struggles and I am reminded that health isn’t something that can be taken for granted. So to all of you and yours, I wish you peace, health, and prosperity. Happy Thanksgiving! Rachel has officially started our new photography business. She had her first shoot a couple of weeks ago, and has another several shoots planned for this month and next. We’re doing a karate tournament on the first Saturday of August, which is the first shoot I’ll get to take part in since the business started (I got to work with our mentor Craig on some other stuff, but this is the first commercial shoot I will have done for our own business). Things are a little slow right now, but we expected this – we actually got started about 2 months late, and missed the window for summer bookings. However, we’re talking to many companies, including dozens of schools, and there are lots of possibilities there. The kids continue to grow. Ryan is looking forward to the 2nd grade, though we’re going to miss his first grade teacher (Mrs. Azimi was fantastic). Evan is, um, quite spirited and independent – far much more than Ryan was at that age. Kaylee is going through potty training now. She will occasionally go to the potty on her own, but still goes in the diaper more often than not. When school resumes, the younger two will be going part time to a church-based day care in Lucas, just a few miles from here. Evan will be on a 4 day program, and Kaylee will have 2 days a week there. Hopefully this will give Rachel enough time to run the business – if not, we’ll look for some supplemental care. We’ve had a really good sitter who has stayed with the kids this summer, but she’s a college student and won’t be available after this month. We’re hoping that the business will build up where we will have the option of returning them to full-time daycare (or at least 3-4 full days per week), but for now it’s a bit of a reach to drop $2200 or more per month on child care. Rachel’s grandfather has not been doing well. He’s been moved to an assisted living facility, which he resisted for a while but he’s slowly learning to adjust. We’re still finding our way down here in the “big” city of Allen. It was a year ago this month that we left Sherman, and overall it’s been a very positive move for us. The kids have gotten used to being away from grandparents, though they still go back to Sherman from time to time to spend the day (or the night) with them. We’ve been attending Chase Oaks Church for a while and have made some new friendships there. All in all, things are going great. Still hopeful that the business will take off, but we’re excited about it all and looking forward to what comes next. More soon! We have opened a new business! We are now independent representatives for TSS Photography, a franchise photography company based in Duluth, Georgia. We will be focusing on sports, event, daycare, corporate, and family photography, and will offer everything from standard portraits to slightly offbeat creative work. Our focus is in the northern Metroplex area (Collin and Denton counties), but we’re working on a deal that will hopefully allow us to push north into Grayson county as well. Rachel will be leaving her job to work full time in this business. She’s got another 6 weeks or so before she leaves her current job, but we’re going to move forward now to start building contacts and finalizing the logistical items required to manage the business. I’ll be working with Rachel in a supporting role, keeping the books and helping with shoots on the weekends. Most of you have seen some of the work we’ve done through pictures of our kids on Facebook and Flickr. Now we want to photograph your kids! If you need family portraits, or if your kids participate in karate/dance/hockey or other nontraditional sports, we’d love to hear from you. In the meantime, you can “like” our new Facebook page to keep up with announcements from us and to follow samples of our work. So since the last post, I’ve been through a lot of changes, personally and professionally. First, and most importantly, I became a father for the third time, our only daughter. Kaylee was born in the middle of the night just 6 days after Ryan’s 6th birthday, after a mere 90 minutes of labor. Rachel was a real trouper, going through the whole birth without anesthetic since the labor came on so suddenly. Kaylee is almost a year old now, and without a doubt has both of her parents wrapped around her finger. Next up: geography. Earlier this summer, we packed up and moved to Allen, Texas. The move to the metroplex area was a decision several years in the making, and to be frank it was probably decided long ago. We had been dissatisfied with a number of aspects of Sherman, with the lack of career opportunities and mediocre public schools at the top of the list. We sold our house in Sherman back in July, moved to an apartment for a couple of months, and then purchased a house late August. After a bit of adjustment for the kids (especially Ryan, who didn’t handle all of the changes very well at first), everyone seems to be adapting well. The boys especially like the new house, since it is the first home they’ve had with stairs. Since my last post, I’ve had some remarkable changes in my career. I left my position at WNJ after four years to take a job with a business intelligence consulting firm in the Dallas area (which was another contributing factor to our move). I found myself getting bored with jobs after 3 years or so, and was searching for a role that would give me enough variety to keep me grounded, and consulting has so far delivered exactly that. I work with and for a great group of people, and the variety of projects to which I am assigned keeps me interested and helps to keep my skills sharp. In addition to the job change, I received the distinction of Microsoft MVP, an annual award that is bestowed on fewer than 300 people in my field. So that’s it for the major changes. Lots of little things to catch up on, but we’ll work through that in future, hopefully more frequent posts. I saw Dr. Caskey this morning for my regular orthodontic checkup. I mentioned to him that I have a big conference (the PASS Summit, which is the Super Bowl for those of us working with SQL Server), and that if possible I’d like to have the braces removed by then. With little hesitation, he agreed to bump the date by 4 weeks and remove them during the last week of October, which is also the week before I leave for PASS. I can’t complain too much about the braces – it was a purely voluntary (read: cosmetic) treatment, and I’ve heard that many others have gone 3-4 years or more in their braces. My 17 months of treatment was minimal in comparison, and I’m very happy with the results.